I think an old fashioned evening news show, reporting world and American news, would be a huge draw. As it is we get whatever the day story is, often planted by Trump, recooked to sell clicks for each host. Someone at CNN,and MSNBC, jist as ta Fox, gets together each night and sets out the evening story. Then the show producers, working with each show’s talking heads, comes up with the spin that will, they hope, draw viewers. The script each evening is is not just boring. The result of this one story a night is that the credibility of serious, journalists is replaces with a perpetual spin. Meanwhile real news is not presented at all. The result is like eating at McDonalds every evening, boring. The extent and ongoing nature of Russian and oether foreign undermining of the US election. Trump’s nuclear deal with the Saudis. The abandonment of our allies the Kurds. Draught issues in East Africa. Trump’s life style at Mar a Lago. Hindu extremism in India, Buddhist extremism in Myanmar. 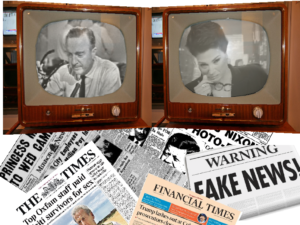 American newscasts have always underreported the news. Because American TV news has always been corporate, and American anti intellectualism. The BBC and Canadian Broadcasting have always been better than even public radio and TV. Radio Free Europe was generally a better news product than the major networks.